Hello, and welcome to the Prosperity Blog Tour, celebrating Riptide Publishing’s release of Prosperity. Thank you so much to That’s What I’m Talking About for hosting me. And, to you, dear reader, for stopping by. I’m trying something a little different with this blog tour. I would very much like to invite you to join me over on Facebook at the Steampunk Flashgroup. A flashgroup is sort of a Facebook pop up shop. 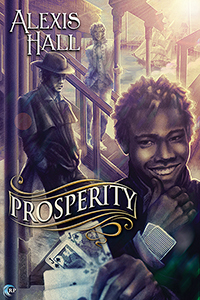 It’s a short-term group that will be active for the length of the Prosperity blog tour. I’ll be over there all week, and a little bit after, talking about the book, giving away many, many things, posting exclusive excerpts of Prosperity and the upcoming sequels, answering any questions, and generally having a ball. I do hope you will pop along and be part of the conversation. I also have postcards showcasing the absolutely stunning Prosperity artwork. If you would like one, please join the group and drop me a message, and I will be delighted to send one winging your way. Thrill! As our hero battles dreadful kraken above Prosperity. Gasp! As the miracles of clockwork engineering allow a dead man to wreak his vengeance upon the living. Marvel! At the aerial escapades of the aethership, Shadowlesss. Beware! The licentious and unchristian example set by the opium-addled navigates, Miss Grey. Disapprove Strongly! Of the utter moral iniquity of the dastardly crime prince, Milord. Swoon! At the dashing skycaptain, Byron Kae. Swoon Again! At the tormented clergyman, Ruben Crowe. October 27th – November 7th: Authors L.A. Witt, Alexis Hall, and Cornelia Grey come together on a Steampunk book tour to celebrate the releases of Precious Metals, Prosperity, and Circus of the Damned. And Gaslamp Fortnight is featuring a fabulous giveaway! Comment on the tour stops for a chance to win a $250 gift certificate to Harlots and Angels Steampunk Corsetry and get your own custom corset or personalized steampunk gear. Each new post you comment on earns you an entry into the drawing, so be sure to check out the rest of the tour schedule, too! Hello I’m Sharon Ince and I own Harlots and Angels. 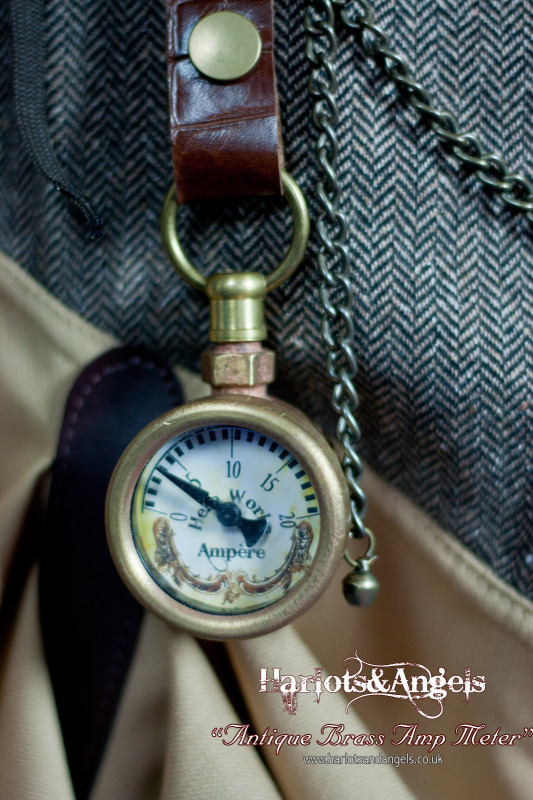 We are a UK based company that creates unusual sewing and crafting patterns, clothing, corsetry, props and accessories with a wide range of themes from Steampunk, Sci-Fi, Victorian, Gothic and Burlesque. We have produced work for a large diversity of clients, including The Disney Corporation, the BBC costuming department, Sky TV, Working Title films as well as several Hollywood production companies and local theatre and film productions. I have always loved to design and I’m self-taught. In fact I started at the early age of about 5 years old and have never stopped. I love to work with leather, sew natural fabrics, sculpt, and build my house with stone and wood; though my real passion is to design. When I am starting out on a new design the hours fly by and I’m lost in the perfect bliss of experimenting, mathematical calculation, followed by the thrill of seeing the idea become reality. My love of Gothic literature, mad inventors and scientists and all things Victorian has always filtered through my thoughts and designs, so when I first discovered the emerging Steampunk community some years ago many of my creations found their family niche. It sounds like a great premise! If you want to hear more about it, and you’re a Facebook user, do feel free to stop by the group – there’s lots of chat and extras. Love steampunk, it has quickly become one of my favorite genres. Alexis does a wonderful job of writing it, perfect mix of history and technology. But I am so glad to hear you are enjoying the book. I hope the steampunk flashgroup was great fun for everyone!